In the heart of Wharekaho (Simpsons Beach), you'll find this two bedroom traditional kiwi holiday bach, located behind the main house. A unique bedroom layout; The master bedroom is located off the living room inside the bach, while the second bedroom with two single beds is an external room to the bach, located off the outside patio area with its own separate door. Therefore if you need to use the bathroom in the middle of the night you have to access it through the bach a few steps from the second bedroom. This is just to point out for those with young children, the sleeping arrangements you’ll need to consider. Please contact the host, Lisa to chat about this in further detail if you need any further information. As you open the gate, the under-covered outdoor dining area/patio awaits you. The main door to the bach, and the door to the second bedroom is located off the patio area. Coastal Bach, a traditional kiwi bach, can accommodate four people comfortably, and there is room for an additional person with the sofa bed located in the living room. The bach includes open planned kitchen, dining and living room. For cooking there is a gas stove hob, and very small electric bench top plug in oven, with all necessary kitchen utensils, pots and pans. Please note, we do not have a big oven for baking. Outside backyard comes with a couple of deck chairs, sun umbrella, gas bbq, and with being fully fenced the property is pet-friendly. 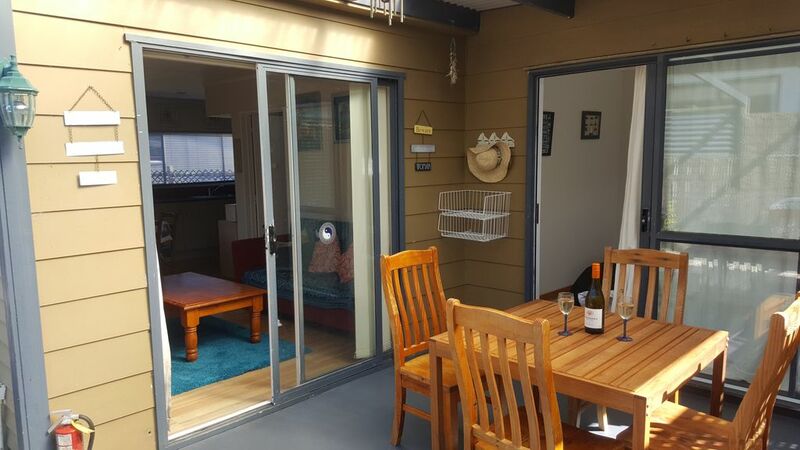 Surrounded by both local neighbours, holiday homes, and a short walk to the beach, and a five-minute drive to Whitianga cafes, bars, restaurants, shopping, and grocery stores. We have one car parking space for the on the shared drive for you. A short walk to the beach, and a five-minute drive to Whitianga cafes, bars, restaurants, shopping, and grocery stores. Enjoy a morning coffee, spend the day relaxing on the beach, or cooking up a bbq in the backyard. Drive into Whitianga to head to the Lost Springs (Age +13), catch a movie, shop, or enjoy a meal at one of the bars, cafes and restaurants available. We really enjoyed our week at this bach, it was a perfect place to take our guest from the UK. It is modest but comfortable, pretty much as described, reflected in the price. Well-located, off the main road and an easy walk to the gorgeous beach. The neighbours were all friendly and helpful. We only had to ring Lisa the manager if we needed anything. The place was peaceful and also ideal for our dog. Thanks. The house was not very clean, in particular the kitchen cupboards and the pillows both smelt. The unit was disjointed, having to unlock 2 doors to go to the toilet at night was a mission. The toilet seat was pitted and stained, the shower was too confined and was like taking a suana as the steam had nowhere to go. The Skye remote was broken, even after buying new batteries. The name Serentity was misleading as the neighbors liked to play loud music, it was also misleading saying it was private, it was not especially the second bedroom. The bench top oven was very old and very small, it would gave been better to have removed it completely. The outside spaces were unkempt, everywhere needed a good clean up, the stones were uncomfortable and noisy to walk on. The only good things I can say is Lisa (the letting agent) was very helpful and the location was good being close to the beautiful Simpsons beach. We were going to stay another night but after talking we all decided to move on. It was a shame as my brother had come from England and requested a trip to the Coromandel. If the place had lived up to its advertising it would have been a different story. We’d like to thank you for being one of our first guests staying in our holiday home. We appreciate your feedback, and have taken it all on-board, and are now working through points you have raised. Suited us perfectly- beach just around the corner, - teenagers were happy, so were mum n dad. Great place and worked well.